Send your kids on a musical journey to Agapeland - a place where everybody loves to sing, dance, and learn about God's love! Featuring the Agapeland Singers and songs even parents will enjoy hearing; these delightful productions teach valuable lessons on the Fruit of the Spirit. Perhaps one of the most influential music products ever made for children, the Agapeland producers influenced a generation! And now they are doing it again with the re-release of all the classic Agapeland favorites on CD! You and your children will visit the colorful garden-kingdom of Agapeland in this classic music CD featuring Stevie™, Nancy™, The Conductor™, and the original recording cast of the Agapeland Singers. Stevie and Nancy enter Agapeland and are introduced to the Music Machine and all of its wonders. The track listing is as follows: "A Land Called Love," "Music Machine," "The Whistle Song," "Smile," "The String Song," "Patience (Herbert The Snail)," "Gentleness," "Faith," "Joy," "Peace," "Goodness," "Love," "Self Control," and "Kindness." This is music with a message that everyone can relate to and features the voice of Pat Boone. This entertaining CD is ideal for trips in the car or homeschool use, so take a break from your day and listen to this positive, Christian CD! An amazing and delightful production that kids will love while learning valuable lessons! So don't wait! Create long-lasting memories with your child. 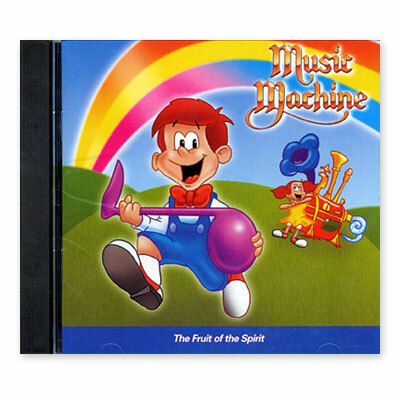 Order the Music Machine The Fruit of the Spirit CD from Alpha Omega Publications today!